Samih al Qasim: There is no blood-stained shred ..of a shirt our upright brothers wore." Arab poetry has, in some circles, become regarded as being synonymous with political resistance. The role of the written word has been fundamental in reinforcing our commitment to assorted causes and marginalized groups. It has also been irreplaceable in emboldening our cultural links, a political act to be sure in the context of the region. However, there seem to be aspects of Arab political verse that tend to be eclipsed by the more traditional slogans of resistance. By that I mean that sometimes the most commanding works are not those that espouse unwavering nationalism, but instead those that reflect the uncertainty and grief of the landscape. And much akin to the subject of their work, these poets are commonly fated to the same devastation and end. Indeed, one of the more protruding reasons behind the strength of Arab verse is its insistence in coinciding with the general sentiment among the people, even when it entails the sacrifice of nationalistic pride. The value of Arab poetics is precisely in its capacity to transcend mere political mantras and, in its place, projects a distinctly human account. It permits the writer the ability to navigate across ideological boundaries and offer to the audience a medium for collectivity, asylum to reflect and lament and rejoice. The poetry of Samih Al Qasim enveloped this multiplicity of perspectives; the evolution of his work concurrently provides a window into the evolution of Palestinian outlook. Although Al Qasim’s poetry is not as prominent as, say, Mahmoud Darwish, mentioning his name to older Palestinians will often elicit a recital of one of his poems from memory. Cultural, locational, and generational separations amongst Arabs have rendered his work at once both renowned and relatively obscure. His is a story that emphasizes the diversity of Palestinian narratives. Al Qasim hails from a Druze family that remained on their land after 1948, he continues to live there today. Although Druze were generally integrated into Israeli armed forces, he rejected conscription and in doing so became the first member of the Druze sect to refuse to serve in the Israeli military. of a shirt our upright brothers wore. No stone to bear their names. 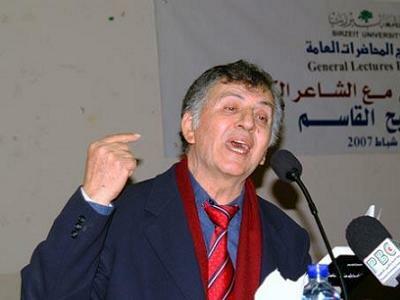 Samih Al Qasim is regarded as one of the forefathers of Palestinian political poetry. Under the restrictions on non-Jewish citizens during Israel’s early years, the poet composed lyrics of resistance that provided Palestinians with one of the few outlets for political expression. “I will not give in,” he writes in Address From The Unemployment Bureau, “I’ll resist/ to the final pulse in my veins!” He would go on to spend time in Israeli prisons for his relentless political writings and work. The excerpt is itself an affirmation of the Palestinian writers ability to access his homeland, as though a magician, despite all attempts of concealment. But more striking is the imagery of the homeland being a corpse, a grim meditation on what might actually be left of historic Palestine. The comparison does not signal Al Qasim’s surrender. However, it does echo the unavoidable cynicism that comes with years of political defeat. Amidst criticism from his peers, and his own disenchantment, the brilliant poet spent his final hours drinking in his apartment before his lit cigarette set fire to the room. It would be the smoke from his collection of cassette tapes, filled with recitals of poetry, that would finally suffocate him. The emphasis on the tragedies that beset these men is not to dwell on their peculiarity. It is to underline the affinity between these writers and their cities. Like walking incarnations, they too felt every destruction and every loss and every disappointment. Despite the aesthetic appeal of regarding them solely as resistance poets, it seems imperative to acknowledge that their work mirrored more than just our political aspiration. And in doing so provided more solace. Our men of letters are unlike the Gore Vidals or John Updikes of the West. The distinction is not made to claim some kind of literary superiority. Instead, it is to point out that Arab writers very commonly absorb and embody the subjects of writing to such an extent that it often instigates their own decline. I am always reminded of Khalil Hawi, that great Lebanese poet who took his own life in response to the Israeli invasion of Lebanon. And although it comes at such personal cost to the poets themselves, it is also unmistakably beautiful. – Talal Alyan is a Palestinian-American freelance writer currently living in New York. He contributed this article to PalestineChronicle.com. Khalil Hawi’s suicide is not “unmistakably beautiful”. It is an ugly disaster like the destruction of his own country. Poets usually mirror their times, celebrate any love-touched thing (person or landscape), protest ugliness and depravity. Poetry is always about love or horror, THAT’S unmistakably a sign of its relevance, its quality, its esentials. That we find beauty in savage death is a sign of our deranged times. Poets must use the pen, not “the knife”.